A skew arch bridge is one where the bridge deck is at an angle to the obstacle it is crossing. In the case of a straight canal a skew bridge would be one which is not at right angles to the canal it is crossing. Skew stone arch bridges are extremely difficult to construct as the joints between the cut stone blocks are not at right angles and every block used is uniquely shaped. Skew arches were in fact first designed and constructed during Roman times. They were rarely used, if at all, between the end of the Roman empire and the start of the canal and railway building boom 250 years ago. They were a useful, if expensive, method for crossing canals at an angle. The first example of skew arch bridges to be built in Ireland or Britain was at the Naas branch of the Grand Canal which was constructed in the 1780’s. The Irish Grand Canal connected the city of Dublin in the East of Ireland to the River Shannon in the West. 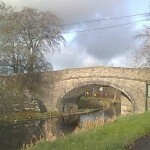 The Naas branch line connected the County Town of Naas with the Grand Canal at the village of Sallins in County Kildare 30km west of Dublin. A different contractor constructed this branch line and their engineer, a Mr. William Chapman, introduced the skew arch masonry bridge to these islands. He deserves praise for this as he created a lot more work for himself and his men by this decision, and all for a relatively minor improvement for the routing of the access road. He was an engineer obviously interested in doing things right even if it was more difficult and time consuming and I wouldn’t be writing about him today if he choose the cheaper and simpler solution of the standard arch bridge. However, unfortunately shortly after the branch line was completed the company who developed it went bust. 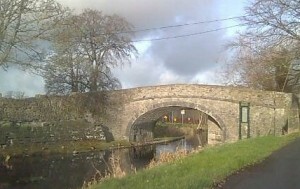 The finished canal was then purchased by the company developing the rest of the rest of the Grand Canal. 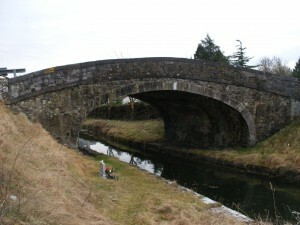 The new owners removed and replaced the skew bridges with standard arched bridges. The presumed reason for the removal of the original bridges is that their head height was too low, and their replacement with standard arch bridges rather than Skew bridges was I assume to reduce the rebuilding costs. As a result of the bridge reconstructions there are sharp bends on the roads that access these ‘newer’ bridges to allow the road running along the canal to cross on the bridges at right angles to the canal. A bridge known as The Shee Bridge close to Allenwood, also in County Kildare, is one of the few surviving examples of Skew bridges on the canals of Ireland. See picture below. Chapman was a hugely productive engineer who designed and supervised a huge number of canal and dock work throughout Britain and Ireland, see more here and here. Nice Web site. My ancestor Charles Wallace was Superintendent of Masonry on the first USA National Road. His Father John came from Derry IR in 1797. For Charles to be that high up, John must have been a stone arch bridge mason in Ireland. I suspect John [born 1755] traveled around Ireland building bridges. Any way to track down who built which bridge? Or even dates? In Wheeling, West Virginia the bridge they likely built is still in use. These are elliptical arch bridges. I understand the arches on the front and back faces of the bridges but don’t understand how the in between part is built. It seems like the whole tube would have to be an arch rather than simple stone stacked up.